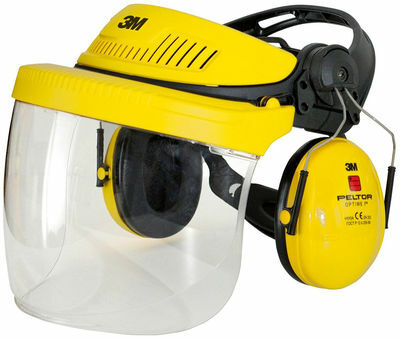 3M™ G500 Forestry Headgear Combination is designed to be combined with hearing protectors or a built-in communication system. A practical, convenient solution for face and hearing protection where no head protection is needed. Frontcover: Ventilation for increased comfort. The front cover is also designed as a cable holder in combination withCommunication products. Integrated eyewear: To increase eye protection, G500 can incorporate the integrated eye protection range (V6*), that are available in clear, grey and yellow. Hearing Protection: Thanks to the robust design of the headband, G500 can be used both with and without earmuffs. The slot is 30 mm and fits the Peltor P3E-earmuff attachment. Headband: Robust design ready to be attached to earmuffs.